Outside of Google Docs, the word collaborator refers to someone who cooperates with an enemy in a time of war. 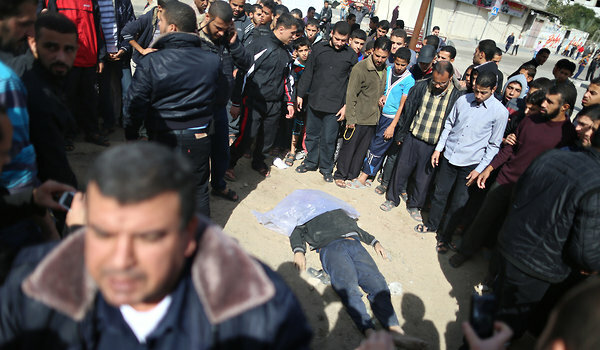 Masked gunmen in Gaza summarily executed a man here on Friday as a suspected collaborator with Israel on the third day of its deadly aerial bombardments, shooting him multiple times and leaving his body beneath a billboard featuring a Hamas fighter holding a rocket. These are the people fighting Israel. These are the people who won’t stop until the Jewish state exists no more, even if millions of Arabs have to die in the process. So why does the world insist that Israel pretend coexistence is possible? You’re forgiven for thinking that the word “savages” just isn’t an adequate descriptor for Israel’s enemies. Israel (little satan) may be the Muslims No. 1 target, but because we (great satan) do not submit to allah and his so-called messenger we too are targets and will suffer continued Islamic attacks. Bloodthirsty, brutal, cruel, inhuman, merciless, vicious monsters. Oh, but we have submitted. obastard was re-elected for starters. Secondly, we kow-tow to Muslims throughout this country – in education, the workplace, and in medical and commercial venues……and even in some courtrooms. Hell, we often don’t even have bullets in our soldiers’ arms for those deployed to the middle east. We are a joke, a sad, sorry-assed joke. Pathetic. It breaks my heart to think of our soldiers who, as it turns out, died in vain over there. Israel should nuke all those bastards NOW before one more missile is launched at them. No, Invade Gaza, load’em all up in a cargo plane, strap parachutes on them and drop them into Libya, Syria and/or Iran. Then dare any other Islamic hell-hole to try ANYTHING but warn them the consequences will be very, very dire. Bet that fella they executed would’ve liked the option of living in a GITMO and a trial by a US military tribunal. I don’t believe not one damn photo coming from Gaza, and haven’t since 2006, since I saw how they did it. Evolutionally challenged sociopathic mud-hut dwelling blood thirsty barbaric false Prophet worshiping savages perpetually struck in the 12th century have no place in the 21st century. Appeasement of the archaic savages of Islam has always failed throughout history and forever will. They’re incapable of comprehending anything more than slaking their blood-lust and worshiping their false Prophet idol. They are Demons incarnate﻿ walking the earth spreading nothing but Destruction & Death — enveloping the entire globe. I stand with the Righteous. Not like it was a Vietnamese general lawfully executing a non-uniformed saboteur in time of war. Said saboteur having been apprehended in the act of murdering unarmed civilians. Now that was a travesty. You think Swiftboat would approve? I had a political philosophy course once and the professor told the class that the next time they saw an Israeli/Palestinian conflict on TV, to just turn off the sound and watch the agony on the faces. He said it would be hard to determine which side was which … meaning, really, that both sides were equally guilty of the violence. His little trick doesn’t work. Even with the sound off, you can still see which side is targeting precise targets and which side is shooting off rockets trying to kill anybody, and as many people, as they can. Was he really seeking to measure the justice of a cause by the agony its participants feel? If someone feels pain then they’re in the right, or at least those who caused the pain are in the wrong? Or what? I’m not sure what this test was supposed to prove. But did this professor imagine that the same agony was not to be found on German and Japanese faces in WW2, or on the faces of common criminals in a shootout with the police? Wonder how many of Obama’s Black Congressional Caucus homies signed on to the House Resolution supporting Israel today…Or, is that a rhetorical question,’Yo? The old: Israel is surrounding by it’s neighboring enemies. The new: Israel, the enemy, surrounds it’s neighbors. Excuse me? Which war has the USA fought in the last 60 years that wasn’t righteous? Is not saving people from slavery and destruction a noble cause?